We shall be creating ACCORDIAN MINI ALBUMS . Size will be 5"x5" with inside pages of 4 1/2" x 4 1/2" . Covers need to be created with Chipboard bases and covered with coordinating cardstock. There needs to be some type of CLOSURE for the album - either a ribbon tie, Belly band, Magnetic flaps, or whatever you want to make. Embellishments are required, but please do not embellish so heavily that the album cannot be closed properly or carried easily. Choices of papers and embellishments are all up to the creator !! I would like them to be completed by February 28th and I will give you a few extra days to mail them out if you need it...no later than March 7th... but try to get done on time. Once we get everyone signed up, I will assign partners by February 2nd. 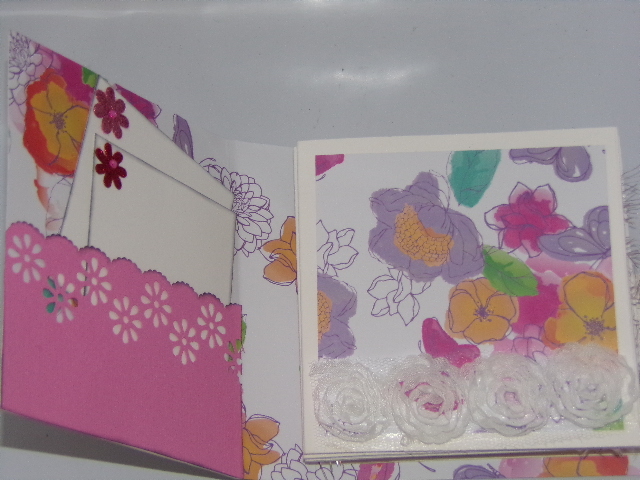 Make this simple accordion album from 12"x12" cardstock as your "base" (please use heavyweight cardstock) ..... When it is completed the final mini album will be have 8 inner pages ... It will measure 4 1/2 "x4 1/2" without covers and approx 5" with the front and back cover. I have found that these little mini albums are great for getting rid of my scrap pieces of patterned paper left over from making my larger mini books. 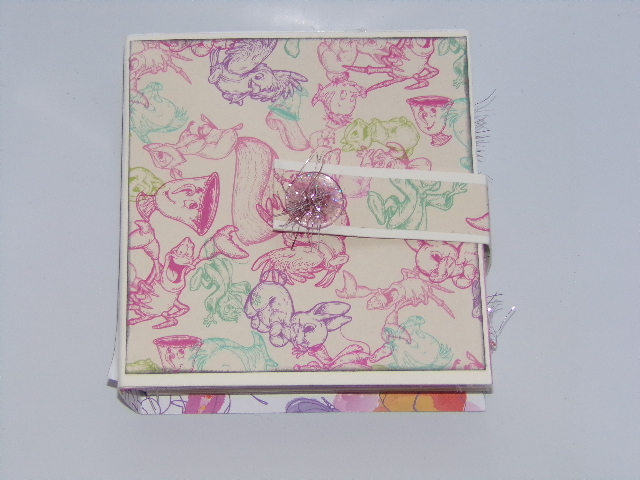 They are also great to add to the inner pages of my other mini albums to hold extra photos or to hide my journaling. Try sticking one to your 12"x12" layouts as well for a neat touch. Because they are so quick and easy to make you can make a few albums to give away as presents - 6 pages is great for a few family pictures taken over the year. 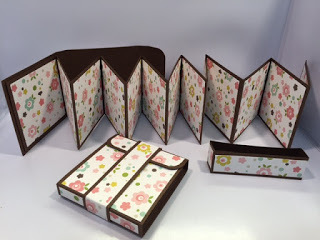 Maybe you can make 6 or so birth announcement card albums for your closest friends and family with pictures and birth information of the newest addition to your family. The covers are made with CHIPBOARDS . Cover them with pretty paper and embellish. Be sure to attach some type of ribbon or twine ties to close the book, or create a " Belly Band" for it. Or some other type of closure. I will post instructions soon for those who need them, or there are many of these to be found on PINTEREST and YOUTUBE. You will make one album for your partner in a theme that she would like.... but the choice of papers and embellishments is all up to you !! sounds like fun. count me in. looks like now I will be home for the first couple of months in 2019.if things change I will let you know. I like it, I like it, I like it!!!! Count me in too please. I may join. It depends on the due date. But if I can, this will be fun! I would love to be included on this one. Okay girls - we have a small group, but that's okay - we will keep trying to get people to be interested in actually participating ! Lynn, you and I are partners for this one - Do you have a preferred THEME, or Colors you would like to have ? I enjoy making these so much ! I would like to have a Grandma's "Brag Book " for my purse to put my Grand-daughters pictures in... Does not have to be all in PINK.... we like all sorts of things... and are planning on a Disney trip soon . Great! I would like a Grandma book as well. We had the gender reveal for my first grandchild today. ITS A GIRL! Doesn’t have to be all pink as well. Not picky at all! Hi Laura, So happy to be partnered with you for this swap, Please let me know what “theme” you would like, colors, a particular style, just everything you would like this album to be. That said, no promises, I will try to live up to your desires. For me, I think I would like an album to put scrapbooking friends pics in. Love all colors, can be bright if you like, only color not excited about is blue. However if it works in album/other colors or design, no problem. Also, do you prefer Laura or Laurie? Thanks for the info Laurie. So many options. I will do my best and pray you will like and be able to use it. Can’t wait for SPRING! Hi GRANDMA LYNN !! I will be happy to make a Baby Brag book for you ! Those are such fun ! Looking forward to seeing what you create for me as well ! Creating but not complete! Having lots of fun doing this! Carol, I am putting your album in the mail today. I hope you like it. Hope it’s not too vintage for you. Had so much fun making it, going to make some more in the same theme, different papers, for gifts. Raining here in Southern Calif. and suppose to rain most of next week. We surely need the rain only concern is for people who live in the fire zones. Hope your weather is better. I’m more of a “sunshine” gal. I got my album today from Lynn and it is totally AWESOME !! Will post pix soon! Laurie, Laurie, Laurie, I received my beautiful, beautiful, beautiful, “tea” album yesterday. I just love, love, love it!!! Did I say I LOVE? Would you mind sharing where you found the papers? Haven’t seen these before. Thank You so very much! I will post pics next week. Sorry to sound like a broken record only couldn’t help myself. I posted pix of the album I received from Lynn on Facebook... It is really beautiful ! THanks so much Lynn ! !